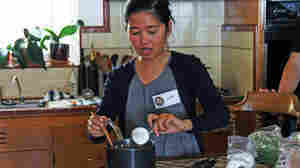 March 24, 2012  Culture Kitchen, a San Francisco company, hires first-generation immigrants as cooking instructors. It tries to find talented cooks who wouldn't normally be teaching because of a language barrier or lack of formal training. March 2, 2012  The Pelaez's lawyer has said they will appeal the judge's ruling. And in the meantime, a U.S. Immigration and Customs Enforcement spokesman says that the agency will not rush to act in her case. Why Could Romney's Father Run For President If He Was Born In Mexico? 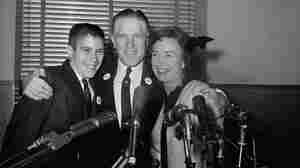 January 27, 2012  The answer: George Romney's parents were U.S. citizens, so at birth he also became a natural-born U.S. citizen. His son, Mitt Romney, brought up George Romney's birth during Thursday's Republican presidential debate to rebut the charge that he's "anti-immigrant." Man Uses iPad, Not Passport, To Gain Entry To U.S.
January 4, 2012  A Canadian man has been making headlines because he used an image of his passport saved on his iPad — instead of the official document itself — to cross the U.S.-Canadian border two times. December 6, 2011  A new survey finds that prospective Iowa Republican caucus-goers favor tough border and workplace immigration enforcement, but favor modernization of legal immigration. October 18, 2011  In the first hour of Talk of the Nation, the GOP candidates and the politics of immigration, and the lessons that can still be learned from Catch-22. In the second hour, administering mental health first aid, and cartoonist Roz Chast on her book, 'What I Hate: From A to Z'. 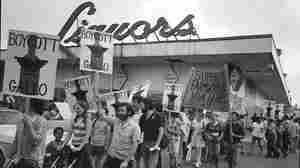 October 14, 2011  The federal government and others continue to challenge the law and further rulings await. July 1, 2011  A new law aimed at illegal immigrants goes into effect in the state in September, and many are already leaving the state. Construction firms will find it harder to fill the many rebuilding and cleanup jobs they'll have open. June 27, 2011  State and local law enforcement agencies cannot opt out of a federal program that uses the agencies' fingerprint samples to enforce U.S. immigration laws, according to federal officials. June 22, 2011  Jose Antonio Vargas, a reporter who shared a Pulitzer Prize at The Washington Post, reveals that over many years he obtained a series of false documents to conceal that fact from employers. Now he wants to be a voice in the immigration debate. May 10, 2011  A federal judge will consider blocking implementation of Utah's controversial immigration enforcement law during a hearing this afternoon. The measure is modeled after Arizona's. May 10, 2011  It's a given of American politics. The president and political party able to achieve immigration reform, or at the very least appear to be trying hard to do so, are likely to gain the loyalty of voters with ties to recent-immigrant communities. December 22, 2010  Obama and his Hispanic allies plan to defend against expected anti-immigrant GOP moves. For instance, they expect a GOP move to end "birthright" citizenship. But there's hope that the GOP 's new power might lead it to work with Obama. October 8, 2010  In honor of Hispanic Heritage Month, NPR producer Felix Contreras interviews his father, a former migrant worker, about labor leader Cesar Chavez.